Hatters chief Nathan Jones was once again left in awe of Luton’s superb away supporters during their 0-0 draw at Notts County on Saturday. In the attendance of 6,313, there were a magnificent 2,033 Luton supporters, making up just over 32 per cent of the overall gate. 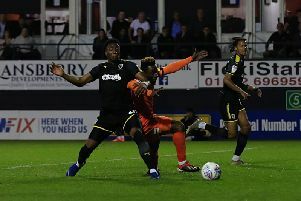 Jones had previously labelled the Luton away following to that of a Championship based club, but had to revise his opinion when hearing of the numbers who travelled to Meadow Lane. He said: “How good were our crowd? To travel up here with that amount, that’s a Championship crowd we have following us around. “I hope they go home reasonably happy. I know they would have liked the win but I thought they were absolutely outstanding again. “That’s phenomenal for anyone, that’s Premier League. Championship sides don’t take that away from home, let alone a League Two side and it’s not as if it’s on our doorstep. Centre half Johnny Mullins was also blown away by the amount who made the trip and hoped a few of them enjoyed a trip to the famed night spots in Nottingham after the game. He added: “They were excellent and they always are, you don’t know what to say sometimes as everything’s been said.